We’re recovering from a nor’easter that dumped almost 20 inches of snow on us. I’m sure everyone in the Northeast is over winter. It’s been storm after storm this winter season and I’m throwing up the white flag and giving up. Let’s hope this weekend’s storm is the last one forecasted for this winter…otherwise we all might lose it! I made Ree’s (aka. 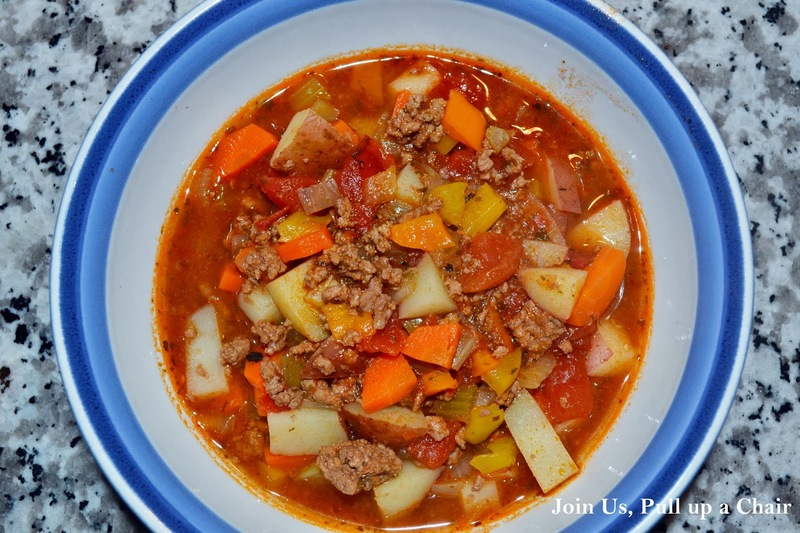 The Pioneer Woman) hamburger soup and it was perfect timing! I loved the soup and how hearty and nutritious it is being packed full of vegetables. It made a good amount of soup and we had enough for leftovers and lunches for a couple of days. In a dutch oven, brown the ground beef over medium-high heat with the onion, celery and garlic. Once the meat is completely cooled, drain off the fat. Add in the remaining ingredients and stir to combine. Bring to a boil and then reduce heat, cover and simmer for 15 to 20 minutes. Once the potatoes are fork-tender, serve with a chunk of bread. Enjoy!